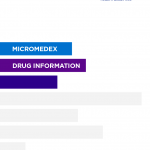 Micromedex Drug Interaction app is a straightforward mobile reference for healthcare practitioners working with medications on a daily basis. This app can help identify and manage potential issues that may come up in daily practice. The app is easy to use. The best iPad medical apps for physicians. Thousands of Pad medical apps were sorted through to come up with this list, ranging from prescription drug reference apps to virtual simulation apps.